Why the cross product? By tabulating everything I learned or know in 4 columns (categories), I can always select a few of them (subset) and notice a lot of recurring themes (questions) and common solution approaches (answers). This corresponds to an old saying “there’s nothing new under the sun”. Then what about innovations? Are we constantly creating something new? Yes, we still are, but if you look closely, there are very few ideas that are fundamentally new that cannot be synthesized by combining the old ones (sometimes recursively). Just with the examples above, many desires can be consolidated along the lines of making ourselves better off, and many problems can be consolidated along the lines of we’re too stupid. Of course it’s not everything, but it shows the power of tabulating into 4 categories and consolidating the parts into few unique themes. I chose to abstract the framework into 4 broad categories instead of 2 because two are too simplified to be useful: since the framework is a way to organize (compactify) observations into manageable number of unique items, there will be too many distinct entries if I have only two categories. Nonetheless, I would refrain from having more than 7 categories because most humans cannot reason effectively with that many levels of nested for-loops (that’s what cross products boils down to). I also separated desires from problems because I realized that way too often people (manager, clients, customers, government, etc.) ask the wrong question (because they narrowed it to the wrong problem) that leads to a lot of wasted work and frequent direction changes. People are too often asked to solve hard problems that turns out to be the wrong ones for fulfilling the motivating desires. Very few learn to trace it back to the source (desires) and find the correct problem to address, which often have easy solutions that’s more valuable to the requester than what was originally asked. This often leads to unhappy outcomes for everybody that’s avoidable. An emphasis on desires is one of my frequently used approaches to prevent these kind of mishaps. while an array already has memory allocated to hold the data. Local arrays: only the instantiating function knows its size. , the array name itself has a superpower that pointers lack: report the underlying allocated data size (NOT pointer size) using sizeof(array). Definition: An array is ‘recognized‘ if the array name is used in the scope that knows the underlying data size. Corollary: Calling the array name with sizeof() gives the underlying allocated data size. Heap allocations always return a pointer type, NOT an array name! So heap arrays are never recognized. x is just a cosmetic shorthand for *x: it doesn’t prevent any recognized array from decaying into a pointer across boundary. The storage duration (static or not) does not matter. e.g. (unless passed carefully by data type T (&array)[N]). int* p = v;     // Decays v to a pointer. Size information lost. // int &w=v; // Does not compile: this means an array of 4 references. Note that the syntax requires a bracket for reference name. Omitting it will lead the compiler to misinterpret it as an array of references, which cannot* be compiled. This means contrary to common beliefs, you can pass a recognized array across functions through reference, but this is rarely done because of the hassle of explicitly entering the number of elements (4 for the example above) as part of the data type. This can still be done through templates/constexpr, but for such inconvenience, we’re better off using std::vector (or std::array if you want near zero overhead). However, so far I haven’t found a way to re-recognize an array from a pointer. That means there is no way to keep a local array’s recognition across function boundaries in C since it does not have references like C++. To summarize with a usage example: this post has described the entire logic needed to decide whether sizeof(x)/sizeof(x) gives you the number of array elements, or how many times your machine pointer type is bigger than the element storage. * references must be bound on creation. Declaring an array of references means you want to bound references in batches. There are no mechanisms to do so as of C++14. Compilers has gotten smarter and smarter nowadays that they’d be able to analyze our code for common patterns (or logically deduce away steps that doesn’t have to be performed at runtime). Matt Godbolt gave a nice presentation at CppCon 2017 named “What Has My Compiler Done for Me Lately?”. Through observing the emitted assembly code at different optimization levels, he showed that the compiler doesn’t need to be micromanaged (through performance hacks in our code) anymore, as it will emit instructions as the performance-hacked code intended when it is better to do so. It means the compiler writers already know our bag of performance hack tricks way better than we do. Their efforts spared us from premature optimization and leave us more time to find a better data structure or algorithm to solve the problem. What I got from the lecture is NOT that we are free to write clumsy code and let the compiler sort it out (though it occasionally can, like factoring a loop doing simple arithmetic series into a one line closed form solution), but we don’t have to make difficult coding choices to accommodate performance anymore. With such LTO, why not do away the virtual specifier and make everything unspecified virtual by default anyway (like Java)? For decades, we’ve been making up stories that some classes are not meant to be derived (like STL containers), but the underlying motive is that we don’t want to pay for vtable if we don’t have to. Instead of confusing new programmers about when should they make a method virtual (plenty of rule-of-thumbs became dogma), focus on telling them whenever they (choose to upcast a reference/pointer to the parent anywhere in their code and) invoke the destructor through the parent reference/pointer, they will pay a ‘hefty’ price of vtable and vptr. I don’t think anybody (old codebase) will get harmed by turning on virtuals by default and let the linker decide if those virtuals can be dropped. If it changes anything, it might turn buggy code with the wrong destructor called into correct code which runs slower and takes up more space. In terms of correctness, this change might break low-level hacks that expects the objects to be of certain size (e.g. alignment) without vptr. Even better, add a class specifier that mandates that all uses of its child must not invoke vtable (have the compiler catch that) unless explicitly overridden (the users decide to pay for the vtable). This way the compiler can warn about performance and space issues for the migration. The old C++’s ideal was “you only pay for the language features you used (written)”, but as compilers gets better, we might be able change it to “you pay extra only for the language features that are actually used (in the finally generated executable) with your permission”. I think days are counting before C++ compilers can do “copy-on-write” like MATLAB does if independent compilation are no longer mandatory! Given my extensive experience with MATLAB, I’d say it took me a while to get used designing my code with “copy-on write” behavior in mind. Always start with expressive, maintainable, readable and correct code keeping in mind the performance concerns only happens under certain conditions (i.e. passed object gets modified inside the function). If people start embracing the mentality of letting the compiler do most of the mechanical optimization, we’ll move towards a world that debugging work are gradually displaced by performance-bottleneck hunting. In my view, anything that can be done systematically by programming (like a boilerplate code or idioms) can eventually be automated by better compiler/linker/IDE and language design. It’s the high-level business logic that needs a lot of software designers/engineers to translate fuzzy requirements into concrete steps. The website also included a feature to share the pasted code through an URL. As seen from the emitted assembly code, the answer is NO. 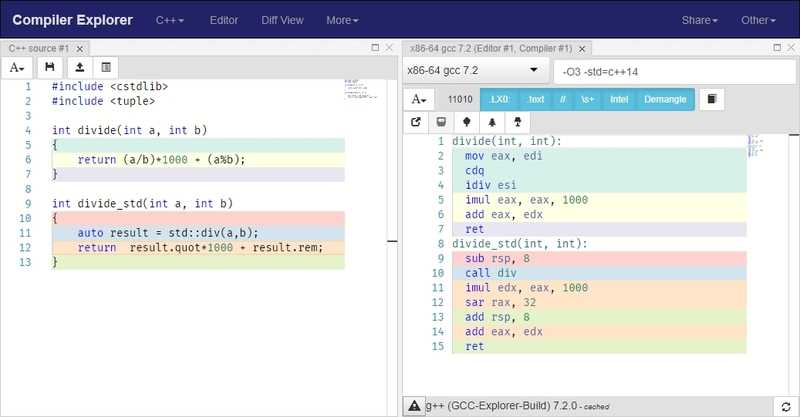 The compiler can figure out that I’m repeating the division twice and do only one division and use the quotient (stored in eax) and remainder (stored in edx). Trying to enforce one division through std::div() requires an extra function call, which is strictly worse. The bottom line: don’t help the compiler! Modern compiler does context free optimizations better than we do. Use the time and energy to rethink about the architecture and data structure instead! I recently watched Louis Brandy’s CppCon presentation “Curiously Recurring C++ Bugs at Facebook” on youtube. For bug#2, which is a well-known trap for STL map-based containers, operator will insert the requested key (associated with a default-constructed value) if it is not found. but would like to see something neater. In bug#3, he added that a very common usage is to return a default when the key is not found. The normal approach requires returning a copy of the default (expensive if it’s large), which tempts noobs to return a local reference (to destroyed temporary variables: guaranteed bug). Considering how much productivity drain a clumsy interface can cause, I think it’s worth spending a few hours of my time approaching it, since I might need to use STL map-based containers myself someday. Endow a STL map-based container with a default_value (common use case), so that the new operator can return a reference without worrying about temporaries getting destroyed. Note that this is private inheritance (can go without virtual destructors since STL doesn’t have it). I have not exposed all the private members and methods back to public with the ‘using’ keyword yet, but you get the idea. Basically, for read-only operations, always operate directly on the chained ‘m.read_only‘ object reference: it will make sure the const protected version of the methods (including read-only operator) is called. Please let me know if it’s a bad idea or there’s some details I’ve missed!